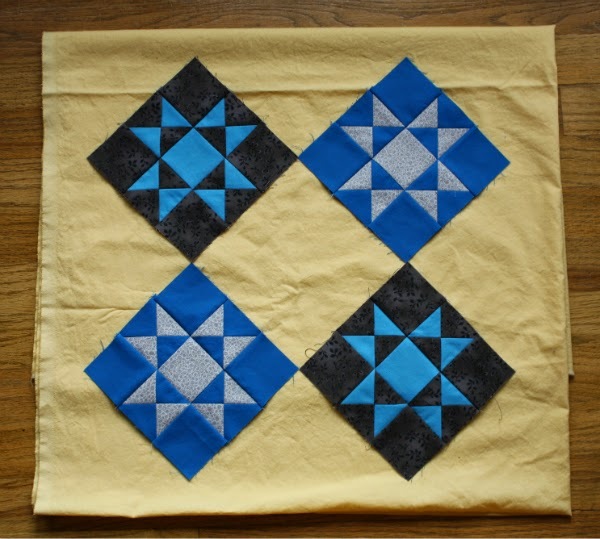 Remember the New Quilt Blogger's Blog Hop, hosted by Beth of Plum and June? You can read my post here. A group of us who participated in the hop have decided to do a round robin style quilt bee together. 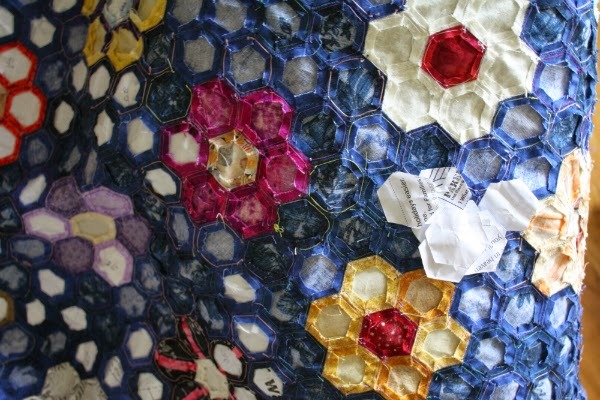 In this style of bee we will mail the quilt from person to person, each of us adding a section or border until it arrives back home as a complete quilt top. Since the quilts will make a sloooow round trip, we've called our group Round Trip Quilts. We're all working on our starting blocks now, in preparation for mailing them on September 1st. I've always loved star quilts, so that's what I've picked as the theme for my quilt. Everyone can make whatever style of star they want to add, which I figure leaves plenty of room for personal expression since there are so many different star blocks out there. I'm starting things off with the classic Ohio star. I used this great tutorial which has cutting instructions for making the block in a bunch of different sizes. I chose the 6" block, and after posting a few different setting on Instagram, Jennifer suggested I try them on point. It's perfect! 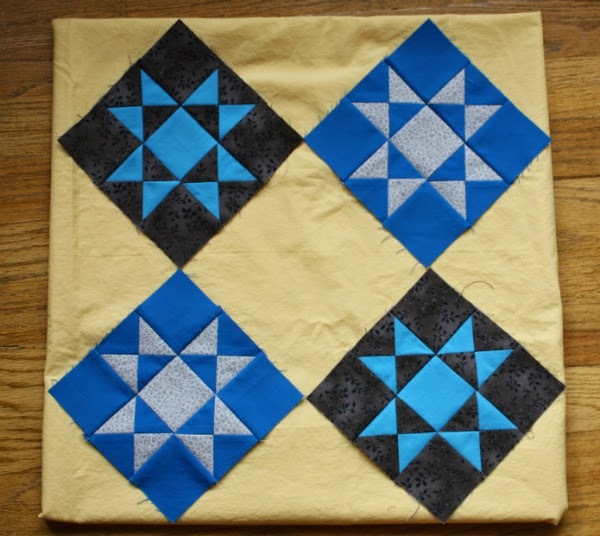 Now I just have to decide if I want to have the star blocks go right to the edge of my starting piece, or if I want to have a small border of the background fabric so it looks like the blocks are kind of floating. What do you think? In other news, I'll be hosting TGIFF this Friday, so be sure to come back to link up all your finishes for the week. I'm removing papers from my epp hexagon flower quilt top today and hoping the weather will cooperate for me to get lots of pictures of it so I can share it on Friday. See you at the TGIFF party! I like the logo. By the looks of it, you are going to have a great round robin. I better get to work so I might have something to share for TGIFF.